Animal Enrichment is very important here at the Toronto Zoo. 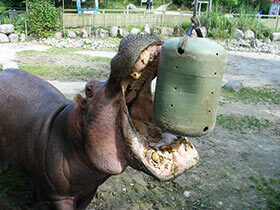 Did you know that each of our animals receive enrichment every day? 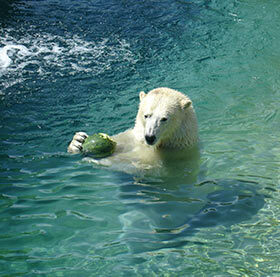 When you visit and notice barrels, toys and other devices within animal exhibits, those objects serve as animal enrichment that plays an important role for many of the species here at the Zoo. Enrichment is a dynamic process for enhancing animal environments within the context of the animals’ behavioural biology and natural history. Environmental changes are made with the goal of increasing the animal’s behavioural choices and drawing out their species appropriate behaviours, thus enhancing animal welfare. For example, many species spend a vast majority of their day in the wild foraging for food. In order for keepers to mimic their animal’s natural behaviours, we can find ways to offer our animals food throughout the day and in various “toys” or “enrichment devices” that would allow these animals to display this foraging behaviour.